Open daily 8am - 9pm. $50 for 60 min. and $75 for 90 min. $100 for 60 min. and $150 for 90 min. A couples massage is a shared experience; two people receiving a deeply relaxing massage in Paso Robles in the same room from two different therapists, while listening to gentle music. An hour, or hour and half, total escape from the daily grind of work, lawns to mow, laundry, the kids, traffic. Nothing to do but drift away in quiet, peaceful time together. Why not try something new? 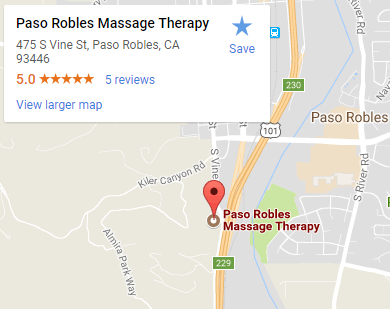 Receiving massages from the skilled therapists at Paso Robles Massage Therapy can introduce couples to a new way to disconnect from the routine, unwind and reconnecting to one another in tranquility. Enjoying each others’ company in a peaceful setting: Sometimes just being quiet together can erase the aggravations of daily life. Being fully engaged in sharing a restful massage at Paso Robles Massage Therapy can bring the same level of sharing to the entire relationship. Massage is reported to increase feelings of affection and intimacy by releasing oxytocin, serotonin and dopamine, creating a sense of contentment and well being that continues after the massage. Couples sometimes struggle with finding time in busy schedules to spend quality, quiet and peaceful time together. A couples massage can be a wonderful way to reconnect. Darryl has experience in both the spa and clinical settings and excels with deeper pressure for therapeutic massage. For clients experiencing intense neck or back pain, Darryl can provide chair massage for their comfort. Sandi has experience in both the spa and clinical settings and enjoys providing medium pressure Swedish Massage for relaxation. Sandi’s gentle style is very calming and great for the first time client. Call (805) 237-8263 to schedule a couples massage in Paso Robles. Press release by San Luis Obispo SEO company Access Publishing, 806 9th Street, #2D, Paso Robles, CA 93446. (805) 226-9890.